A-Lone Peak - Describes the single mountain in the forefront of the expansive mountain views at this property. The "Lone Peak" is in the center of your view, and is a closer view, but the "Lone Peak" is embraced with a background of picturesque long range views on both sides of it. The "Lone Peak" is also a mixture of words, with the cabin also being perched on a magnificent piece of mountain property, all by itself, you are all "A-Lone". The Lone Peak cabin is easily accessed by any vehicle and has a tremendous amount of parking and turn around area. The cabin is at the dead end of a private and gated driveway, there are no other cabins you will pass, and no one will be past you as well. Lone Peak is newly renovated inside and out, with upgraded exterior items, like a flat yard area, great fire pit, and comfortable covered porches to enjoy the magnificent views. Once inside the cabin, you will notice the unique smell of rich pine, the open and airy main floor with expansive vaulted ceiling, and the upscale furnishings and fixtures providing a cozy and comfortable cabin experience. On the main floor there is a queen bedroom, full bathroom, and then the kitchen, dining room, and living room are all in the open floor plan, with views of the North Georgia mountains. In the upstairs of the cabin is a nice and private master suite, complete with queen bed, TV, full bath, and closet. In the basement area of the cabin is another master suite with a king bed, full bath with large tile shower and jacuzzi tub. Also, in the basement is a living area/game area that has a nice flat screen tv, mini fridge, and a shuffle board game. Outside the back of the cabin is a good size flat yard, a beautiful fire pit, and comfy chairs to sit by the fire and enjoy the beautiful Blue Ridge Mountain views. There are two covered porches, one out of the basement area that has the warm and bubbly hot tub and a grill. Out of the mail floor of the cabin the back porch has several chairs and nice view to the fire pit below as well as the view of the close and long range mountains. A-Lone Peak provides the perfect serenity, solitude, luxury, and quality that is expected in a Blue Ridge Georgia cabin rental. Once you stay once you will want to return, a perfect place to come and be A-Lone. 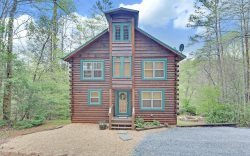 This Blue Ridge Georgia Mountain Cabin Rental is located approximately 12-14 minutes from Downtown Blue Ridge, GA. The cabin is a true log cabin in the Mineral Bluff (Northeast of Blue Ridge), which is very close to Lake Blue Ridge Marina, Toccoa River, multiple river tubing companies, Blue Ridge Canopy Adventures, and the town of Blue Ridge, GA. A-Lone Peak is very private and is considered a secluded Blue Ridge, Georgia Cabin Rental. When we couldn't figure out the TV, we called John and he was very responsive. Service was good. Good package upon arrival and LOVE the checkout. An Excellent experience. We will be back. With the unexpected, last minute events that occur with the military, the team was extremely helpful with changing the dates around for us. When I realized our rental wasnt going to have a wood burning fireplace the team was wondering and quick to find a property we would love. Our stay was so cozy and quiet. Just what we needed! Loved this cabin! Our puppy loved having a whole room to himself on the main floor, ha! Super cozy and private. Loved the short distance to town. The team was wonderful. They upgraded us for free due to an issue at our original cabin before we ever arrived. I could have not asked for a better location, better cabin or better experience. This was our first visit to North Georgia and it won't be our last! We will forever have a special bond with this place, as we just got engaged there! I have always loved the personal attention this staff gives. It is evident they either have outstanding internal communication or their process of taking notes helps them ask the right question (see earlier notes about my old pet). They were accommodating when our original cabin was taken off the market to place us in one of equal or greater value. They did allow an hour early check-in because of weather and our situation of a pet that was not feeling the best. I cannot say enough to how they take care of their clients and this is why we use them every single year and will continue to do so! The views were fantastic and most of the amenities were enjoyed by all. Our stay was wonderful. We enjoyed the privacy this cabin offers. The staff were pleasant and we will definitely be back! Georgia is awesome to work with. She's a sweetheart!hey are a down-home folks with a focus on making sure you find the perfect getaway and have a great experience. I rented the cabin for our cook team during the Blue Ridge Blues & BBQ Festival. The cabin was great and met our needs. I just wish we had had more time to actually enjoy the cabin. Unfortunately, all we ever get to do is shower, sleep, and out the door. Maybe someday we'll stay an extra day. Good prices. Great selection. And fantastic customer service. I thought I might have to cancel my reservation because of everyobody not being able to make it. They offered to maybe find a different cabin or let me re-schedule for a future date. Gladly we did not have to change everything but the office was wonderful to work with. They also referred us to a transportaion company that shuttled from the cabin to downtown making St Patricks Day fun for everyone. A LONE PEAK is a wonderful cabin. We stayed there for the St Patricks Day weekend and couldn't have chose a better coompany, or cabin, for the weekend. The staff was a joy to work with and they even referred us a transportation company that shuttled us from the cabin to downtown Blue Ridge. I will definitely use Georgia Mountain Cabin Rentals in the future. Everyone was nice and friendly. Youve been easy to work with especially coming from so far away. The property was beautiful and gave us exactly what we needed. This is the second time we have been to this cabin its breathtaking and has given us some lasting memories. Great cabins and great people to deal with. Very nice inside. Good view. Nice property. the view from the main balcony and the super luxurious jacuzzi! The house also comes equipped with a nice gameroom and plenty of mini refrigerators and ice chests for entertaining. We loved the cabin, we loved the view, and wished we could have stayed longer. The new electronic lock was very nice, and we were glad we could leave for home without having to return to the office with the cabin key. The staff and service is exceptional. All of the properties are exactly what is listed - we have never been disappointed with our stays. very relaxingn. I thought this location was awesome. We loved being a little bit away from Blue Ridge and seeing another area other than the Aska Road area. Everything was as described and the cabin was gorgeous. We'll definitely be back during the summer. Best cabin i've been to by far. This was a last minute decision. We literally called the day before our arrival and found out there was a new cabin that GA Mtn Cabin Rentals had just attained. There weren't even any pictures so we were going sight unseen. We were anxiously optimistic as we arrived. We were amazed when we pulled up to the cabin. The cabin , and the views from the cabin, were absolutely beautiful. The property was in ridiculously pristine condition. We were blown away at how clean and well-stocked the cabin was upon our arrival. The cabin was immaculately clean. It was fully stocked with items that we didn't expect, including two different types of grills (barbeque and gas), plenty of dishware, even a coffee bean grinder that we made use of. There were literally more options than I could possibly list. We loved, loved, loved our cabin and the views. Lastly, we made a last minute call on the day of our checkout b/c we didn't want to leave just yet. It was on a Sunday at 8:30am so I wasn't optimistic that anyone would be available to return our call. To my surprise, my call was returned within 20 minutes and we extended our stay with a late checkout. The cabin, the views and the management company were just awesome. We will absolutely be returning.